It's June Inspiration week at Lawn Fawn! Today we are playing with the new set So Smooth...a perfect set for summer. 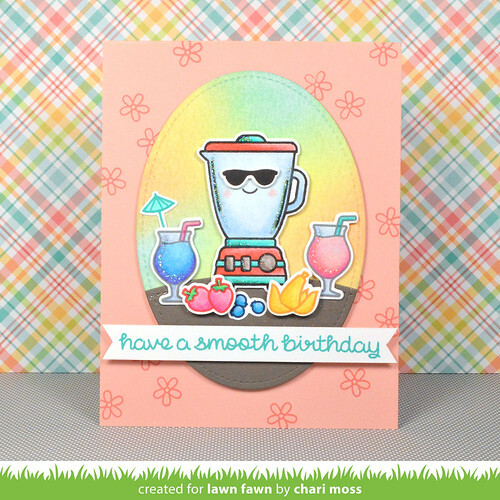 I wanted to create a very summery card so I kept the colors soft by using colored pencils to color my images. I also used different colored inks to stamp my images rather than using black for all of them. I think that adds to the soft summery look of the card. I blended distress inks on the stitched oval background for a summery sunset kind of look. I used Guava ink to stamps some flowers around on the pink card base and stamped the sentiment in Merman ink on a sentiment banner trimmed down to fit the width of my vertical card. 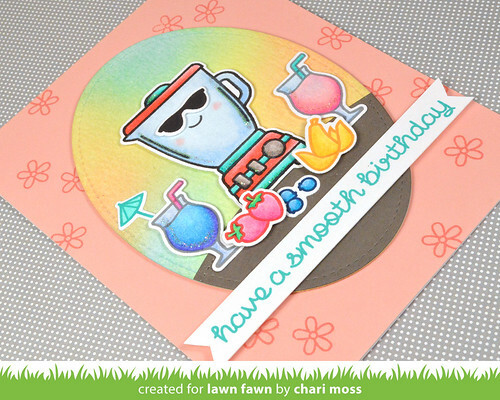 Be sure to check out the Lawn Fawn blog for more "So Smooth" projects from the design team! Oh my goodness Chari this is sweet! I love the soft summery colours. Those sunglasses are hilarious on the blender. Very clever! Wow, awesome blending in this card!! !